This will maybe be the most popular product of the year! 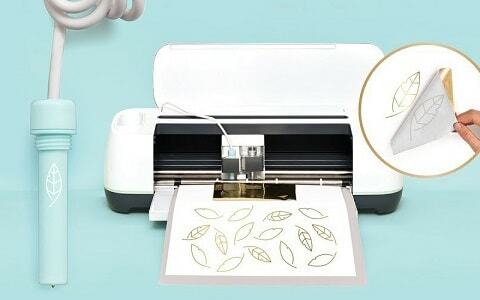 We R Memory Keepers Foil Quill allows you to transform your Cricut machine or your CAMEO into a foiling machine. The collection includes heat-activated pens, foil sheets, foil rolls, and designs from some of your favorite designers. It works with any artwork (SVG and PNG), but you will love these USB design drives that include 200 icons, phrases, and more. The best way to get started is to buy the All-In-One Kit. Designers include Heidi Swapp, Amy Tangerine, Kelly Creates, and more. Speaking of foil and Heidi Swapp, there was a MINC release, too. In addition to some cool new accessories and projects, they released several tools that should make your projects better. One last thing before we get away from We R Memory Keepers: they have also released Big Happy Jig supplies, which revisits last year's popular release of the Happy Jig. As you might've guessed, the new Happy Jig is bigger and allows you to do larger wire-bending projects. With Valentine's day coming up in February, it's time to celebrate the spirit of togetherness with your loved ones in your projects. 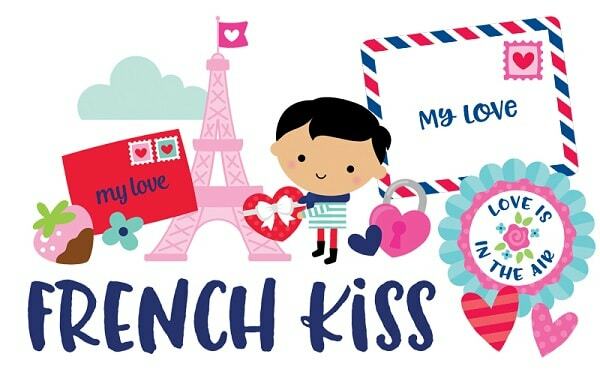 You can create romantic-themed crafts using the Stay Sweet collection by Amy Tangerine or the French Kiss collection by Doodlebug. Show your feelings of love, affection, and friendship with the style and sweetness they bring. Next comes St. Patrick's Day! Be as crafty as a leprechaun using the Lots O' Luck collection by Doodlebug. Create delightful greeting cards for your friends, or scrapbook your holiday memories. Feel the luck of the Irish in your projects with cute patterns and colors, as well as icons like leprechauns, rainbows, unicorns, pots of gold, and more! It will be the perfect addition to your craft supply closet. Easter Wishes supplies by Lori Whitlock will add a punch of Easter cheer to your crafts. The Bunny Trail collection by Becky Fleck features Peter Cottontail and friends with a playful spring color palette. Don't forget about PhotoPlay Easter Joy. Last, but not least, we have the Hoppy Easter collection, by Doodlebug Designs. The Spring Fling collection by Lori Whitlock is inspired by the colorful brightness of spring. We love Echo Park designs and Spring Fling is so pretty. Other options you should check out include Spring Farmhouse and Springtime, both Simple Stories. All these collections will get you ready for spring-themed crafts and other happy projects! PhotoPlay Bunny Trail is sure to be a hit! Carta Bella Flower Market isn't just a spring-themed collection, but it will work great for those types of projects. Don't forget about Doodlebug Simply Spring! You can get going on your summer projects with the beautiful designs from American Crafts, like the Pebbles Oh Summertime and the Sunny Days collection by Crate Paper. The former has mermaids and cute ocean critters designs in a rainbow color palette. The latter is designed by Maggie Holmes and has a combination of coastal summer and boho designs in a warm color palette. So if you're looking for something to use for your fun-filled and fun-in-the-sun memories, then you can't go wrong with these collections. Opening day is just around the corner. Celebrate our national pastime with fun projects made with Carta Bella Baseball. Color Fresh by Heidi Swapp offers fresh and colorful designs. With a beautiful mix of colors, they brighten any paper crafting project. The Color Kaleidoscope collection by Vicki Boutin comes with delightful designs and patterns in contrasting dark and light shades. Are you welcoming a baby this 2019? Whether it’s a boy or a girl, we have Echo Park Hello Baby Boy and the Hello Baby Girl collection, too. If that's not enough to satisfy you, we also happen to have Snuggle Up Boy and Snuggle Up Girl, by Deena Rutter. They have a soft, delicate color palette, adorable patterns, and darling baby icons that are great for your memories with your baby! If you want to add some floral designs to your projects, then you will love Belle Fleur by Becky Fleck and the blossoming patterns found in the Bee-utiful You by Bo Bunny. Do you love to travel? Achieve your travel goals and document all of your fun memories with these new collections. 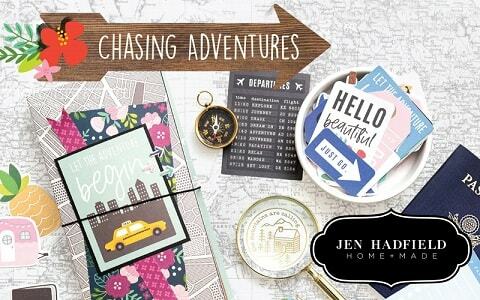 The Chasing Adventures supplies by Jen Hadfield come with patterns and landscapes inspired from locations around the globe. The Simple Vintage Traveler collection is great for any vacation themed project. Last, but not least, Here & There supplies by Traci Smith features a vintage yet modern style for your classic photos, snapshots, and more! They are perfect for keeping more of your adventure moments. What greater adventure is there than an Animal Safari by Echo Park?! For girls, there is the Little Princess collection by Simple Stories and the Echo Park Mermaid Dreams, and for boys, a great option would be the To the Moon and Back collection by Shawna Clingerman. It is a fascinating way to use in documenting your favorite moments with them or even as projects in school. Featuring adorable aliens, spaceships, planets, and more, it will be a perfect gift. Try Pirate Tales paper and embellishments, for fun projects. 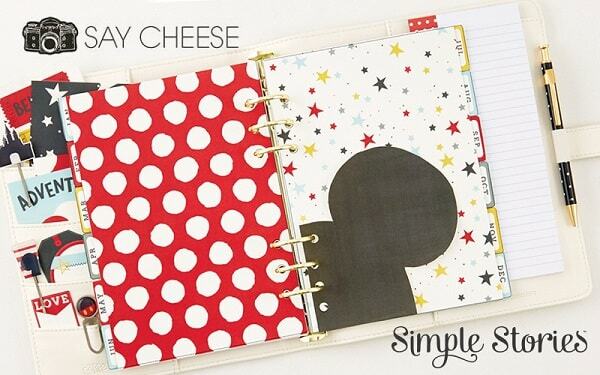 Bringing up the rear, we have some random, everyday type themed scrapbook sets, like the delightful patterns and designs of the Free Bird collection by Traci Smith, Say Cheese 4 by Simple Stories, and Harmony by Bo Bunny. This Spellbinders Shadowbox collection is designed by Becca Feeken and it includes over a dozen solutions for paper crafters. Each design works great as a home decorating piece. It's the perfect way to frame a phrase or sentiment that you want to take hold in your household. The Sharyn Sowell Happy collection is also a great option, and this theme is perfect for celebrations. In case you are unfamiliar, Spellbinders mostly makes dies, but they have a few stamps and embossing solutions, and more. We've carried their products for a year now and our customers love them, particularly the Artomology collection by Jane Davenport. We've added a new brand to our lineup, and we are so excited for Art Impressions stamps and dies. Cutting and stamping intricate and innovative designs is made easy with their fun solutions. You will be amazed at the unique designs they've come up with.